Situated on the north east coast of North Wales, the beach is a long stretch of sand divided by sea defences. It has a large tidal range and is gently sloping from low tide towards the high tide area, which is bordered by a promenade. The water quality sample point is opposite the café adjacent to the Nova Centre. There are two significant intermittent discharges in the Rhyl area which could impact on Prestatyn bathing waters under certain tidal conditions. Westbourne Avenue Sewage Pumping Station discharges into the Clwyd Estuary approximately 7 kilometres west of Prestatyn Beach. Rhyl Coast Road Pumping Station discharges into the Rhyl Cut shortly before it outfalls on the beach 3 kilometres away from Prestatyn Beach. There are a number of pumping station and sewer overflows located in Prestatyn which discharge to Prestatyn Gutter. 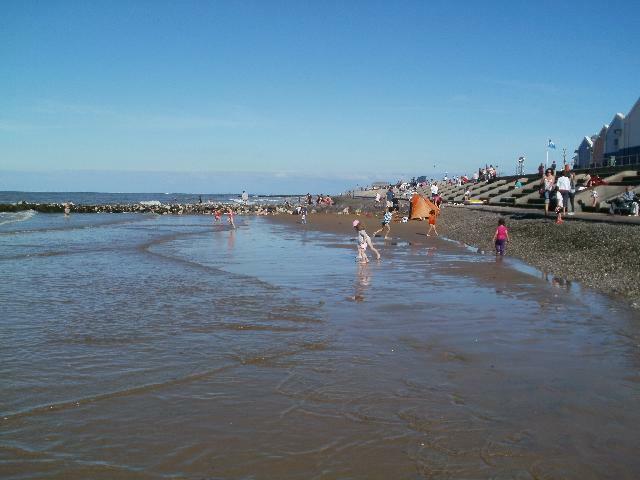 Natural Resources Wales are currently working with Dŵr Cymru Welsh Water to identify the benefit to Rhyl bathing waters of further investment and upgrading of their assets. It is likely that any further improvements to Rhyl bathing waters will also benefit those at Prestatyn. Natural Resources Wales establishes sources of pollution around Prestatyn. Some of this work is carried out in partnership with Denbighshire County Council and Dŵr Cymru Welsh Water. Inspections are carried out by Natural Resources Wales in partnership with the local authority and the water company. These are carried out pre-season (before the 1st of May) and mid season if required (during the bathing water season). Natural Resources Wales continues to work with Denbighshire County Council to maintain the high standard of water quality at Prestatyn. Denbighshire County Council continues to monitor the non-designated beaches on the same date as the Natural Resources Wales monitors Prestatyn EC Beach. This enables weekly data to be gathered of water quality in the wider area. Wrongly connected wastewater pipes can affect the water quality of rivers and the sea. Misconnections have been historically resolved through partnership working between Natural Resources Wales and Denbighshire County Council. Any further suspect misconnections will be investigated as they arise. Modern sewerage systems have two separate systems, one takes foul sewage to sewage treatment, the other takes rainwater runoff through surface water drains to rivers, lakes and the sea. Misconnections occur when waste water pipes are plumbed into surface water drains instead of the foul water sewerage system. This can give rise to pollution when the waste water is discharged directly to the environment through the surface water drain. For example, a washing machine or toilet may be incorrectly plumbed so that it discharges to the surface drain rather than the foul sewage drain. Streams are typically affected by sewage or industrial run off from further up the catchment. Historical monitoring of the River Clwyd has shown a reduction in bacteria in recent years. Previous work has included identifying point source and diffuse pollution entering the river and its many tributaries, then carrying out work to reduce these inputs. Extra sample points around Prestatyn are also monitored. Kinmel Bay Sewage Treatment Works discharges secondary treated final effluent through a 4 kilometre outfall pipe. The length of this outfall pipe was determined from modelling which predicted the discharge would not impact on nearby bathing waters. Rhuddlan Sewage Treatment Works discharges ultra violet treated effluent into the River Clwyd at Rhuddlan. The River Clwyd can impact on water quality at Prestatyn under certain tidal conditions. A project was set up in 2006 to improve water quality of the River Clwyd. The focus of this work has been aimed at engaging with the agricultural community to minimise the impact of diffuse pollution run-off and share best practice methods. The River Clwyd can impact on water quality at Prestatyn under certain tidal conditions. A project was set up in 2006 to improve water quality of the River Clwyd and a proportion of this work has been aimed at engaging with industry, to minimise the impact of industrial pollution. The River Clwyd can impact on water quality at Prestatyn under certain tidal conditions. A project was set up in 2006, to improve water quality of the River Clwyd. A proportion of this work has focused on meeting with private owners, to minimise the impact of private discharges. Natural Resources Wales has also visited several sites in the Prestatyn area that discharge to coastal waters. Poorly maintained private sewage treatment facilities could be a source of pollution, therefore the registration of all private sewage systems in Wales is required by 30 June 2012. The primary aim of this exercise is to provide increased protection for the environment and sensitive features such as bathing water beaches. Where properties are identified in the catchment that are not on mains sewerage, Natural Resources Wales will endeavour to ensure registration has been made. Prestatyn is located over 6 kilometres to the east of the mouth of the River Clwyd. This river drains the Vale of Clwyd from as far up as Ruthin and beyond. Within the vale, farming is of major economic importance and much of the land is used for this purpose. The vale also supports a number of towns and villages such as Rhyl, St Asaph and Denbigh. Approximately 3 kilometres to the west of the bathing water is the outfall to Rhyl Cut, which drains both urban and rural areas of Rhyl and Prestatyn. Approximately 3.5 kilometres to the east, is the mouth of Prestatyn Gutter which drains areas of Prestatyn. Approximately 600 metres to the west is a surface water outfall serving a housing development within Prestatyn. The majority of sewers in England and Wales are “combined sewers” and carry both sewage and surface water from roofs and drains. A storm overflow operates during heavy rainfall when the sewerage system becomes overwhelmed by the amount of surface water. The overflow prevents sewage from backing up pipes and flooding properties and gardens. An emergency overflow will only operate infrequently, for example due to pump failure or blockage in the sewerage system. It is the Environment Agency and Natural Resources Wales role to drive improvement of water quality at bathing waters that are at risk of failing European standards. It is natural for water to run off the land to the sea. Water quality at a bathing water is dependent upon the type and area of land (the catchment) draining to the water and the activities undertaken in that catchment. Discharges from sewage treatment works have improved substantially in England and Wales since the 1980s.